We have all heard the sayings “Lower than dirt. Dirt poor. Dirt bag.” Soil (let’s call it by its proper name) has been like the Rodney Dangerfield of the natural world - - it hasn’t gotten much respect. But that is changing, and people like Kristen Ohlson are helping to bring about that change. In her 2014 book, “The Soil Will Save Us,” published by Rodale, Ohlson takes us on a captivating journey through the complex world beneath our feet and argues that soil may be our new best friend as the world community struggles to find solutions to a plethora of seemingly intractable environmental crises, including climate change, food security, and degradation of our land and water resources. The basic premise of the book is this: If we treat the soil right by using regenerative management practices -- no till, minimizing chemical inputs, planting cover crops and, where cattle are involved, using a practice called mob grazing -- the soil will return the favor by providing us with vastly increased productivity, biological diversity and carbon storage capacity. 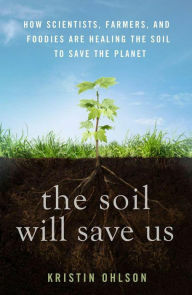 Early in the book, Ohlson quotes one of her cadre of “underground heroes,” soil scientist Rattan Lal of the University of Ohio, who boldly proclaims, “With good soil practices, we could reverse global warming.” That statement certainly made me want to read on! The alchemy that makes this happen is the partnership between plants and a “vast underground kingdom” of microorganisms. Along with macro soil dwellers like earthworms, they form what soil scientist Elaine Ingham calls the “soil food web.” Plants create carbon sugars through photosynthesis. Up to 40% of these sugars are shunted to their roots where they are gobbled up by microorganisms, including fungi, bacteria, protozoa, nematodes and microarthropods. (By the way, did you know there are more microorganisms in a teaspoon of healthy soil than the number of people on earth?) In return, the microorganisms process these goodies into minerals and nutrients needed by the plants. As they do so, they form a protective cluster around the plant roots, impeding entry by soil pathogens lurking nearby. They also secrete a sticky substance called glomalin that begins the aggregate building process essential to soil fertility and water retention. As this symbiosis continues in a properly managed landscape, amazing things can happen. Carbon is extracted from the atmosphere and stored at the rate of three tons of atmospheric carbon for every ton sequestered. Soil volume and productivity increases. Water, a scarce resource in so much of the world, is retained, preventing runoff and hedging against drought. Gabe Brown, another of Ohlson’s underground heroes, is a North Dakota farmer who made the transition from traditional to regenerative agriculture. His efforts to work with nature by practicing no till, using a cover crop “cocktail” of 10 or more species, and eliminating chemical inputs have been rewarded handsomely; he runs the most profitable farm in his county. He has become a farmer celebrity, traveling the country and the world to teach other farmers about his soil management practices. (You can see a YouTube presentation by Brown, as well as other interesting soil related videos at: https://www.youtube.com/watch?v=CkY2Hp-A6pM ). As she rounds out her exploration of why we should care about healthy soils, Ohlson tackles other important topics, such as food politics and the unlikely alliance emerging among farmers, conservationists and financiers. Although the thrust of the book is about farming, Ohlson does touch briefly into the potential for using regenerative practices in the urban and home landscape. One example she notes is the work of microbial ecologist Peter Groffman, who studies soil and water functioning in Baltimore. He has concluded that, contrary to popular belief, lawns are not biological deserts, but can be managed to increase soil health and biodiversity. In the same vein, Bob Streitmatter, manager of the Luthy Botanical Garden in Peoria, has started a popular new program to teach homeowners how to create healthy soil in their yards. As a budding Master Gardener, reading about their work has piqued my interest in learning more about how regenerative practices can be adapted to gardens and the home landscape.